Ever since his Monty Python days, Terry Gilliam has embraced the absurd, the surreal, and the satirical. 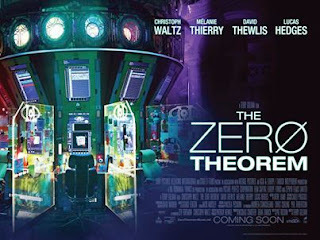 Forming the supposedly final destination in his journey through dystopian satire, following the acclaimed 'Brazil' (1985) and '12 Monkeys' (1995), 'The Zero Theorem' reiterates Gilliam's position as a visionary director. A strikingly bald Christoph Waltz stars as the eccentric Qohen, an introverted programmer for a corporation based in an alternate near-future London. Qohen is recruited to work on the Zero Theorem - a complex and maths problem that also explores whether life indeed has any purpose. In addition to tackling this seemingly unsolvable issue, Qohen battles his own crippling existential angst. Much to his chagrin, Qohen finds his private life and work constantly interrupted. The alluring Bainsley (Melanie Thierry), the alarmingly young Bob (Lucas Hedges), and Qohen's virtual therapist (a hilarious turn from Tilda Swinton) all permeate Qohen's existence, in the attempt to liberate his mind yet also hold some control over the troubled programmer. Despite the convoluted nature of Pat Rushin's script, Gilliam is at his world-building best here, creating a vivid and hypnotic setting at every turn. Something of a meditation on our current largely digitally-based communication, 'The Zero Theorem' somewhat unravels towards its conclusion but its build-up is compelling. 'The Zero Theorem' is out in UK cinemas tomorrow, through Sony Pictures. The film premiered in the UK at the 2013 BFI London Film Festival.